A Picturesque Tale of Progress is a nine-book set of children's history books by the same author as the My Bookhouse series. Originally published in 1933, and reprinted in the 1950s, these books follow the history of human beings around the world from the stone age through the exploration of the Americas. This first book, Beginnings I, starts out with a fictionalized narrative of what life may have been like during the stone age. Using technological advancements (development of tools, discovery of fire, etc.) as a guide, the text traces the development of the human race through its most primitive stages, and then shifts its focus to ancient Egypt. 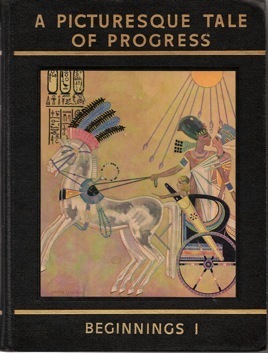 The book ends with the decline of Egypt after many centuries of great power and prosperity. Though I still have two years before my oldest is required to attend school, I'm starting to evaluate potential homeschool resources. We recently purchased this set at a used bookstore, and I decided the easiest thing to do - especially given this month's nonfiction focus for the Old School Kidlit Reading Challenge - would be to simply read through the whole thing and write up my thoughts. I don't expect to get through the entire set during this month, but we'll see how things go. My first impression of this book, for the first 75 pages or so, was that it was very readable. At that point, I was considering it as a possible resource for first grade. The characters the author creates to represent different types of primitive people felt very relateable (even if they had silly names), and I found everything very easy to follow. When the focus shifted to real historical figures, however, it seemed like there was a big jump in reading level. The book is very detailed in its treatment of Egyptian history, naming every pharaoh in succession and explaining how each one contributed to the culture of his time. As it goes on, this section of the book also incorporates a variety of first-person accounts and folk tales, involving the gods worshiped by the ancient Egyptians and narratives recorded on papyrus scrolls discovered centuries later. It is a lot of information, and after a while, my eyes completely glazed over. A few key figures jumped out at me as very interesting and appealing to learn about, especially Hatshepsut, the first female pharaoh and Akhenaten, the first pharaoh to promote the idea of a loving, all-knowing God, but much of the rest of the text seemed unnecessarily detailed. Though there are illustrations, I felt like I really would have benefited from a chart to help me keep track off all the Thutmoses and Amenhoteps. And I also questioned whether every single one of these pharaohs was significant enough to merit a mention. I did like the summary at the back of the book, and I think it would be very beneficial for me to read the summary of each book before introducing it in our homeschool. It contextualizes all of that information to give a sense of what the author is really trying to convey, and helps clarify which details are really paramount to understanding this time period and which are secondary. When I was a kid, I had a really hard time reading history texts because I could never figure out which were the key names, facts, dates, and events. I definitely want to be able to teach my kids how to read history and actually get something out of it, so it helps a lot to have that quick summary to keep me focused. Having finished this book, I can say that it is definitely too much for an early elementary school student, so we'll be saving the series for the middle grades when we'll want a bit more detail. I'm looking forward to the next volume, Beginnings II, as it includes a lot of Biblical history, which will hopefully be a lot more familiar to me!